I’ve been thinking for a few weeks about an article written by Chris Bosh of the Miami Heat in Wired about why he felt all kids should learn computer coding. “We use code every time we’re on the phone, on the web, out shopping — it’s become how our world is run,” writes Bosh. For one of the most famous basketball players in the world, learning computer programming was a way for him to feel secure in a post-basketball world. 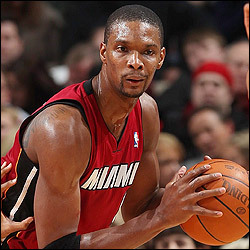 What I found interesting about Bosh was how he became introduced to coding. While in high school, he joined an organization called Whizkids which taught students how to make computer graphics. By being introduced to the power of graphics and computers at a young age, Bosh has continued to pursue his passion for coding. He even appeared in this video for code.org. While it is difficult for the humanities to bring pure computer graphics software into their classes, it is possible to bring the concept of using graphics on a computer to tell a story. Here are three programs that humanities teachers can bring into their classes to show students how computers and graphics can be used together. Who knows, maybe a student or two after using these programs will be motivated to pursue programming like Chris Bosh did. StoryBoard That allows students to create their own comic-like storyboards as a way to tell a story or to show understanding after a concept has been learned. PowToon lets students create animated videos and presentations using cartoon images and a number of other cool features. A program like PowToon can get students to think about presentations differently while reinforcing the need to be creative and engaging. I even created my own PowToon! Simple Diagrams is a program that does just what the name says–you can use it to create really simple diagrams. Unlike the other two apps, this is a program that needs to be downloaded and eventually purchased. I’ve used Simple Diagrams and think it’s a great way for students to show understanding by creating amazing graphics. Letting kids explore computer programs that teach basic skills like animation, cartooning, and design in humanities classes can serve as a bridge to more complex concepts like learning C++ or Python. Using basic programs like PowToon is exactly how I got started on computers and then moved on to more complex initiatives like creating my own webpages with my former co-teacher, Sarah Gross. Last year we created this activity kit for the National Writing Project (and subsequently greatly enhanced by the fine people at Mozilla). I’m still a total novice at programming (okay, I totally stink) but, like Chris Bosh, I think it might be one of the most important skills students can learn.